Lukanji Area, Idakho Central Ward, Kakamega County, is experiencing the restoration of a hope lost long ago. Their very on daughter, Triza Atuka, is the one who is carrying up a lit candle in the community, the apple of their eye, and with it the hope of the community. The same community that has seen many young people drop out of school and parents struggling to bring food to the table. In 2016, Triza Atuka, Kenya National Team and Pipeline Kenya Volleyball player who traces her roots in Lukanji sat down and conjured a plan to help her community in the fight against the jigger menace. She teamed up with a number of her friends to raise funds for a clinic with the aim of “creating the Lukanji jiggers’ awareness to the World”. Sensitizing the youths of Lukanji on the benefits of education, hard work in their academic ventures and sports. Offering training opportunities (with the facilitation of partner community-based organizations) on major topical issues on the spread of jiggers and how best to eradicate the menace. Empower the youths of Lukanji with adequate knowledge and the requisite expertise to confront the sociocultural challenges that they constantly face, including but not limited to increasing school dropout rates, peer pressure, early pregnancies, juvenile delinquency and petty crime. Allowing children to enjoy their childhood as any normal child would do with least/no hindrance from the jigger infestation. 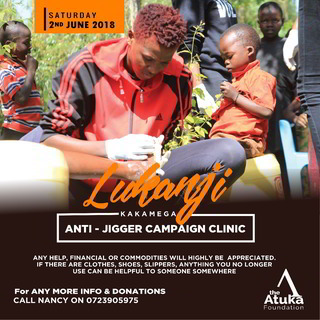 This is to inform you that on Saturday 2 June 2018, I will be at Lukanji Area for my jigger campaign clinic. As you all know I launched a Foundation earlier to help curb this menace around my home area but the response from the neighbouring communities has been overwhelming and hence this clinic. My aim in this clinic is to reach as many as possible in the area to help curb this menace that is denying young kids and families the opportunity to live a normal life as anyone should. I cant do this alone and I appreciate everyone who has been with me through this journey. I hereby humbly request for any help, financial or commodities. If there are clothes, shoes, slippers, anything you no longer use, don't throw them away, they can be helpful to someone somewhere. I'll appreciate if the same is channelled to me and one can contact me through my inbox or the lady tasked with watching over the kids every day in Nancy Shimule on 0723905975 and we will know how we will reach you to collect the same.